Canadian astronaut David Saint-Jacques has completed his first ever spacewalk. Saint-Jacques and NASA astronaut Anne McClain accomplished their work in six hours, 29 minutes, with no apparent issues. Canadian astronaut David Saint-Jacques has completed his first ever spacewalk. Saint-Jacques and NASA astronaut Anne McClain accomplished the feat in six hours, 29 minutes, with no apparent issues. Saint-Jacques, 49, joins an exclusive group of astronauts by becoming just the fourth Canadian to complete such a mission and the first from the country to do so since 2007. 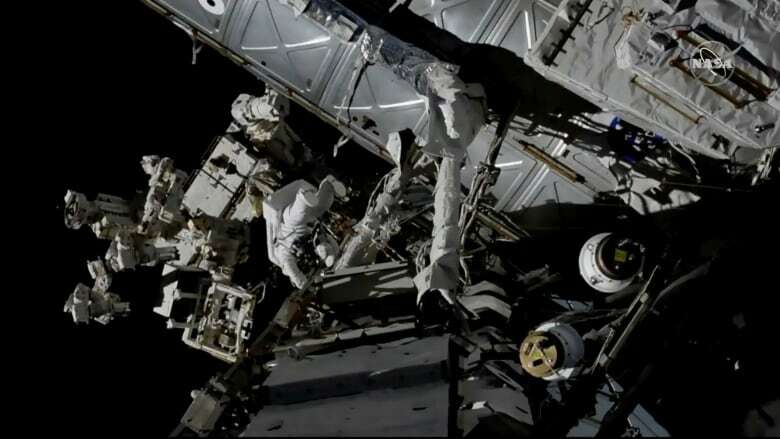 He and McClain officially began their spacewalk shortly after 7:30 a.m. ET according to the U.S. space agency — about half-an-hour ahead of schedule. Their tasks included relocating a battery adaptor plate, upgrading the station's wireless communication system and connecting jumper cables along the midpoint of the station's main truss to give Canadarm2 an alternative power source. Saint-Jacques arrived at the space station with McClain and Oleg Kononenko of the Russian space agency Roscosmos on Dec. 3. He is scheduled to return to Earth in June. Want to learn more about what the astronauts hope to achieve? Watch NASA's technical briefing. Their six-month mission began in December. The next spacewalk will be next month by the two Russians on board. Two other Americans round out the six-person crew. Saint-Jacques — a doctor, engineer and astrophysicist — is the first Canadian Space Agency astronaut to travel to space since Chris Hadfield in 2013.